As far as pure talent stands, Collingwood premiership captain Tony Shaw always rated his youngest brother Neville as the most gifted member of the three Shaw siblings to play VFL football with the Magpies. Frustratingly for him, and for Magpie fans, his time with the Magpies was only fleeting. But for a different set of circumstances, a better relationship with his coach, and most importantly an ill-timed knee injury which slowed him up a little, Neville would almost certainly have played more than the 43 senior games against his name. That he played his last game with the Magpies when he was only 21 years of age seems cruel now, in an age when AFL footballers often get multiple chances to make their way in the game, with some getting a second chance years after their initial crack at it. Neville was 10 years younger than Ray, and four years Tony’s junior, but he always seemed to hold his own in the competitive backyard world in the Shaw household. Football and cricket were Neville’s forte, and given his lineage, it seemed predetermined that he would one day wear the Collingwood colours, as Ray and Tony had, and as his eldest brother, Kelvin, had as captain of the club’s under 19s. The timing wasn’t right for a trifecta of Shaw brothers to play together at Collingwood. By the time Neville was playing seniors with the Magpies, Ray had been gone for a few seasons and was captain-coach of Preston in the VFA. Neville, who was 175cm (the same size as Ray, and five centimetres taller than Tony, wasn’t selected for the opening two games of the 1984 season. But he made his debut in the Round 3 game against Essendon at the inhospitable Windy Hill. His first match came as a 19-year-old in the No.51 jumper, playing alongside Tony – who was playing his 108th match. But his debut was overshadowed by new Magpie Ron Andrews taking on his old Essendon teammates in his first game in black and white. All eyes were on Andrews, though Neville – who was actually a late inclusion – acquitted himself well, with 18 disposals and a goal. It was the first of 20 games in a maiden season that saw him kick 18 goals, including a haul of three goals against Fitzroy in his seventh game. He played in a variety of positions, occasionally through the midfield, but mostly spending time in attack, quickly winning credit for his hard-at-the-ball approach and his neat skills. He was every bit as gutsy as his older brother – and teammate – and was one of those ‘smart’, old-fashioned footballers who seemed to know where to be to get the ball. The only time he lost his spot in 1984 was when he was suspended for two weeks for striking Hawthorn’s Russell Shields. But he returned and played in each of Collingwood’s three finals that season. There were frustrations ahead for Shaw. He still managed 15 games in 1985 (when switching to his brother Ray’s No.23), though found himself playing increasingly out of the back pocket, where he won a reputation as a no-nonsense, dashing defender. But two different issues stopped him from having an even greater impact. After playing the first five games, including a strong 26-disposal effort against the Swans in Round 5, he was involved in a car accident. He had to have 40 stitches in his recovery, and missed two weeks of football. Then he dislocated his shoulder at the midway point of the season and was on the sidelines again for five more weeks. Shaw won his way back into the team to play the last five games of the year, with the hope that he could get a clearer run at it the following season. Frustratingly, that wasn’t to be. He played the opening two months of the season, producing some good football along the way, but after kicking an early goal against Hawthorn in Round 8, he suffered a torn cruciate ligament in his knee. That effectively ended his career in black and white. Brother Tony would later maintain that knee injury proved the difference, with coach Leigh Matthews believing Neville’s pace was going to be an issue that stopped him making an impact. Neville transferred to West Adelaide in the SANFL and produced some of his best football in what was then a seriously competitive league. 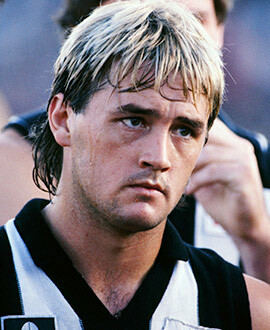 He won back-to-back best and fairests with them in 1988 and 1989, with many wondering if his departure from Collingwood had come too early, and wondering why he didn’t get another chance. By 1990, he was an assistant playing coach at Lavington, in the same season that Tony was leading Collingwood to the flag. He was there to enjoy his brother’s success, but never felt slighted that he had missed out. That was Nifty’s manner – as Tony would say – a bloke who wasn’t given to regrets, and who always got on with it. Neville didn’t play in that famous flag, but he did his fair share of celebrating. During the celebrations Tony recalled seeing Neville having a snooze in the old Victoria Park rooms after a big night. There was always talk Neville might return to Collingwood. “I may have started that one,” Tony would say, but that never eventuated, and when he was 28, Neville was struck down by debilitating arthritis. As tough as it was, it hasn’t stopped him from having a highly-decorated lawn bowls career, and for remaining the easy-going mate that his team members recall with affection. He may not have played as many VFL games as he should have, but he’s still an important part of the Shaw family history at Collingwood.